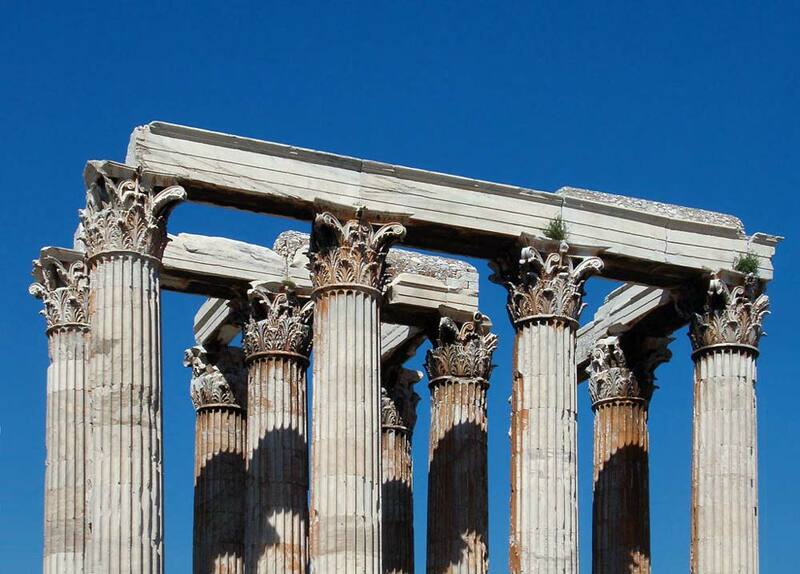 The Temple of Olympian Zeus is a now largely destroyed structure in central Athens. It is alternatively known as the Olympeion. In ancient times it was dedicated to the chief Greek god, Zeus. It was begun during a period of Athenian supremacy in the Hellenistic world in the sixth century BC, but it took over 600 years to be completed. It remained important well into Roman times, but was eventually destroyed by barbarian raiders. The site of the temple, which lies a little under half a mile from Syntagma Square, was already the location of a monument to Zeus. An earlier temple stood there for about 30 years in the mid sixth century BC, with construction of the present buildings being started later in that century. The driving forces behind the project, Hipparchos and Hippias, were the sons of a Greek tyrant who had died in about 520 BC. They intended to make the new temple the largest and most imposing in the world, surpassing even the Temple of Artemis, which was counted as one of the Seven Wonders of the World. Four architects were involved in the building of the temple. These included Porinus, Antimachides, Callaeschrus, and Antistates. They planned a temple that would stand atop an enormous pedestal, with dimensions of around 350 feet by 130 feet. It was to be constructed in the Corinthian manner with limestone quarried locally. There would also be 21 columns on the temple’s flanks and 8 at the back and front of the building. In 510 BC, with the overthrow of Hippias, building work came to a halt. At this point only the platform and a few columns were completed. In the democratic era, Athenians shied away from completing the temple as they thought that its scale was excessive. Aristotle suggested that building works on such a scale were a useful way for tyrants to keep their people occupied, leaving them no spare time with which they could plot rebellions against the state. Serious efforts to continue the temple only resumed in 174 BC. Antiochus IV of the Seleuchids, who claimed that he was the representation of Zeus on Earth, changed the design slightly. He asked for a triple row of columns at the front and the back and requested Decimus Cossutius, a Roman architect, to oversee the project. Rather than limestone, Antiochus ordered that marble should be used, despite its much greater cost. When the king died in 164 BC, work again stopped, with the building still far from completion. When Athens was attacked by Lucius Cornelius Sulla in 86 BC, the temple was badly damaged, with some of its columns being carried off to Rome to be used in the Temple of Jupiter. Almost a century later, during the reign of the Emperor Augustus, there were some attempts to continue the project. However, it was not until the 120’s, when the pro-Greek emperor Hadrian was in power, that it was finally finished. The emperor himself conducted the temple’s formal dedication ceremony in 132 BC. In recognition of the generosity that had been shown to the city by Hadrian in allowing the Temple of Olympian Zeus to be completed at last, the Athenian people erected a vast statue of the emperor close to the building. A similarly enormous statue of Zeus, created of ivory and gold in the by then almost extinct chryselephantine style, occupied the temple’s cella. Dotted around the temple precinct were a large number of other statues, some depicting Roman gods and some Hadrian himself. When Athens was attacked by the Heruli in 267 AD, considerable damage was done to the temple. In 425 AD, ruler Theodosius II issued an edict banning the continuing worship of pagan gods. A Christian basilica was constructed close by in around 500 AD. The builders of this used material taken from what remained of the temple of Zeus. During the expansion of the city of Athens in early medieval times, much of the temple’s marble and other stone was used for the construction of churches and houses. By the 15th century, only around one fifth of the columns were still intact, the others having been taken or destroyed. During Ottoman rule of Greece more columns were demolished. The name of the temple was disputed during the Ottoman period. Greeks called it the Temple of Hadrian, whereas Turks referred to it as the Palace of Belkis. By the 19th century, little more of the temple was left than 16 columns. One of the columns fell down in 1852 during a great storm. The huge statue that once stood within it has long since been lost.